CGI Limited surfaced earlier this year as new entry into the MLM cryptocurrency niche. Combining unregistered securities with cryptocurrency gambling through Coinsinos, CGI Limited planned to operate via its betchips altcoin. Since our February 2018 CGI Limited review, the company has rebranded itself as CGI Global. CGI, Ltd., has always been a temporary brand, while carefully determining the strategic branding and marketing strategy around the name Magellan. We were able to obtain the domain, MagellanInternational.com. Magellan International Alliances, Corp., has contracted with one of the most experienced and talented Marketing Agencies to provide the highest quality tools to help you be more efficient and successful. Interestingly enough, over a month later and the Magellan International website domain is still parked. CGI Global promotion of Magellan International however is in full swing. Primarily through social media, CGI Global are currently recruiting gullible investors in Africa on the promise they’ll “earn millions”. As I understand it CGI Global and Magellan International revolve around betchip investment. From there’s it’s the same old MLM cryptocurrency hype story: Invest today and, *somethingsomething insert actual value here*, we’ll all be driving Lamborghinis in no time. It’s worth noting that although CGI Global is concentrating marketing efforts in Africa, Alexa still peg the US as the largest source of traffic to the CGI Global website (65%). At the time of publication, neither CGI Global, Magellan International or co-founders Lorence Irvine and Daniel Grenon are registered to offer securities in the US. Are those their names? Or does that area use nicknames or something. Names like that (aspirational English word) are quite common in certain parts of Africa, and someone whose name is Honour Jabs in Greek is hardly in a position to make fun. The vast majority of Western names are just as funny as African names, only in a different language. Amanda and Daniel mean largely the same thing as Love and Judicate, only from Latin and Hebrew respectively. Thanks for exposing this scam.. Let all culprits be locked behind bars. It’s such a disappointment that the world Will never benefit from genuine MLM companies because of some little scammes. These folks should learn a lesson once and for all and their scams should be taken down instantly. Thanks so much for the update, we shall not be victims of this scam thing. i love innovative minds in africa be it scam or anything else. That is portraying that we thinking of future investment of this continent. I support their move… only jealous that my name didnt appear in the list of the so called scamers. There’s nothing “innovative” about a Ponzi scheme. You’re supporting financial fraud and making excuses for scammers. Network Marketing Industry is huge and we can ruin it for a few crooked fellows.. Shame on them. Apparently, these clueless idiots don’t bother to read much, let alone study, learn, and stay up to date on what is happening in the industry from a regulatory and legal perspective! 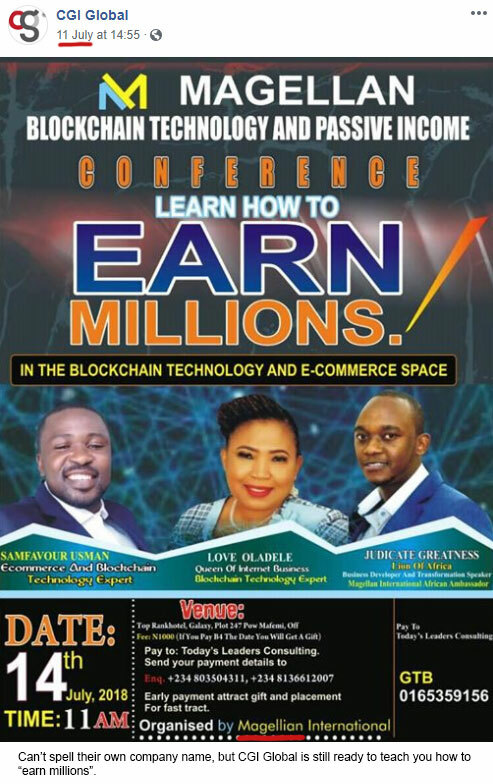 First, regulators such as the SEC’s in numerous countries around the world, including Africa, have deemed ANY mlm program that is promoting the buying and selling of a crypto-currency and its new coin and initial coin offering, OR bitcoin mining, OR trading to be an illegal ponzi/pyramid scheme, as they are considered to be promoting an “investment,” a “security,” or in the case of bitcoin, an “unregistered security,” without the company and ALL of its reps having a securities license, automatically qualifying the program as a ponzi/pyramid scheme from a legal point of view. Talk about making it easy for regulators to prove you’re promoting an investment without a securities license! How stupid can one be? Well, when you’re not aware of the above, it’s easy to be doing things you shouldn’t be doing! Apparently these geniuses also aren’t aware that violating securities laws, as well as ponzi/pyramid scheme statutes, involves big fines and jail/prison terms of several years or longer! And even after explaining to them why programs like Magellan are illegal ponzi/pyramid schemes, showing them articles from top MLM industry attorneys like Jeff Babener, who explain why they’re illegal from a regulatory and legal perspective, show them reviews from watchdog websites like this one, and show them the penalties involved if caught, they either ignore the information and education and keep promoting their illegal program, or worse, want to argue! They’ve had no training in regulatory compliance, have no legal background, have limited knowledge of and/or experience in the industry, and wouldn’t know how to identify a ponzi/pyramid scheme if their life depended on it, and here they are ignoring or wanting to argue with top industry attorneys and experts! They give the word “stupid” a whole new meaning! These fools think that because a company has an office, it must be a legitimate company and opportunity, or that because the program is paying, therefore it must be legal. Talk about uninformed and naive! I can get a answer from anyone about my 2000.00 investment I made in the US. No one informed me of not being able to do business in the US. Now I’m blocked from my account until business can be approved in the US. All I want is my investment returned or to transfer it into bitcoin. How about a answer this time. Answer: You invested in a Ponzi scheme and now your money is gone. Sorry for your loss. Did you send Jef Welch a message? He is the CEO and he should be where the buck stops. They decided apparently to stop in the USA with no disclosure or policy about how they were going to refund money to those in the USA. Instead they freeze your account and make it impossible to contact customer service. I have invested in this Magellan betchip. I wish I made my research before I joined this company. What a scam for some few crooks too bad.